Today I'm in Harrisburg to visit state senators and ask them to support SB 501. I have already visited my state senator, Randy Vulakovich, at his Shaler office and I know he won't support this bill. His reason? "There wouldn't be enough room to store the guns if we took them away from people with a final PFA," he said. Really? That's your reason? 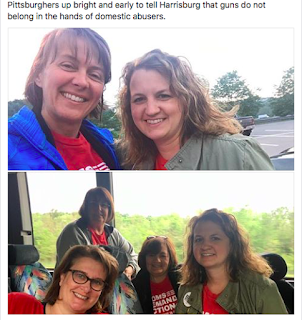 There's no room to store the guns from people judged to be guilty of domestic violence, so let's just let the violent person keep the guns so the violent person can use them to kill women, children, and first responders. I need your help to let elected officials know this is not acceptable. I'm here making personal visits. I ask you to make a phone call. Just one phone call. Find your PA State Senator and Representative here. Read more about SB501 here.